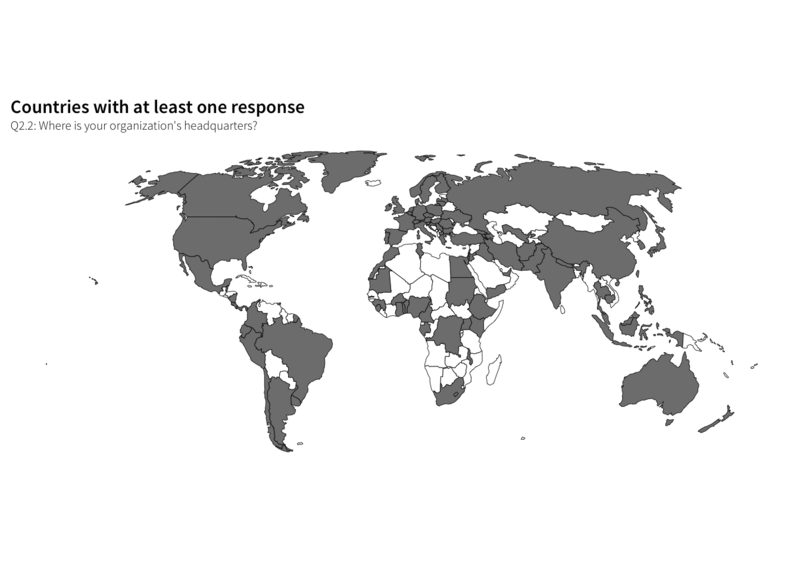 How many respondents answered questions for more than one country? 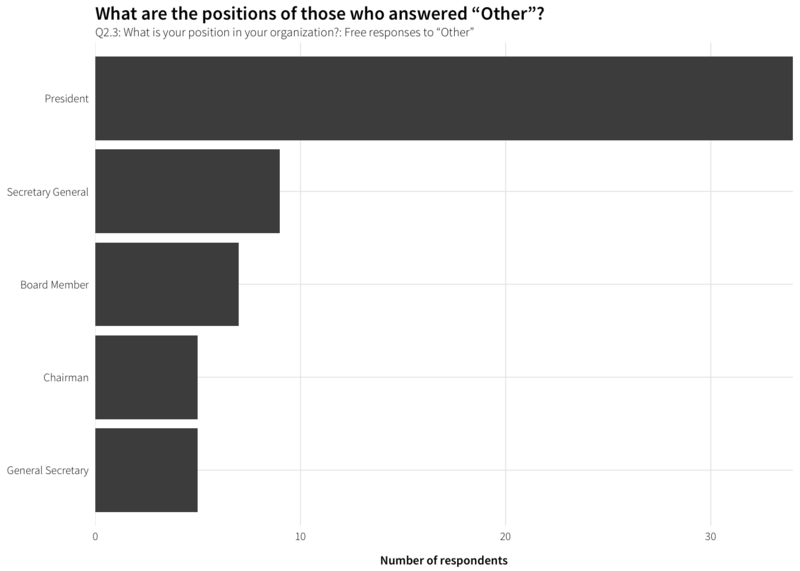 Who in the organization responded to the survey? Lots of others. Who are the others? 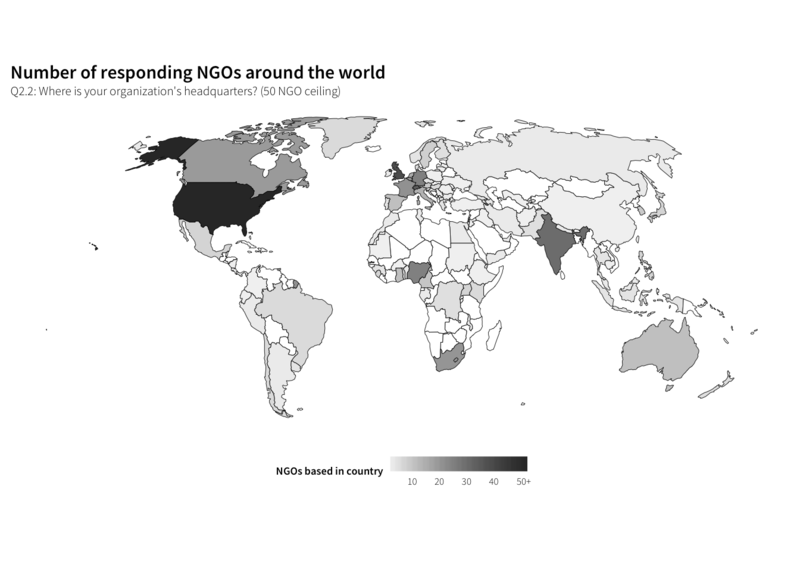 How are these NGOs distributed by HQ? 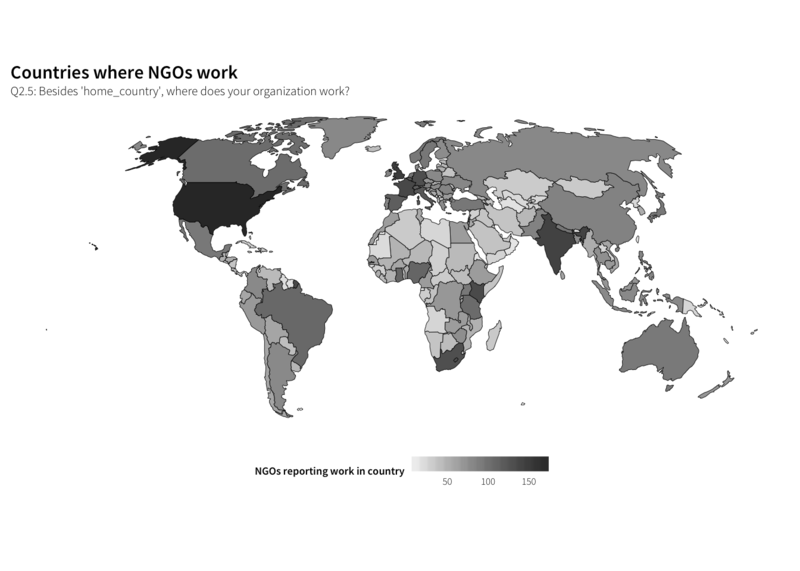 Where do these NGOs work? Not plotting because the organization-county-region unit is a little wonky. That’s pretty much every country! There are 172 recognized countries in the map file, so mapping them out is kind of pointless. 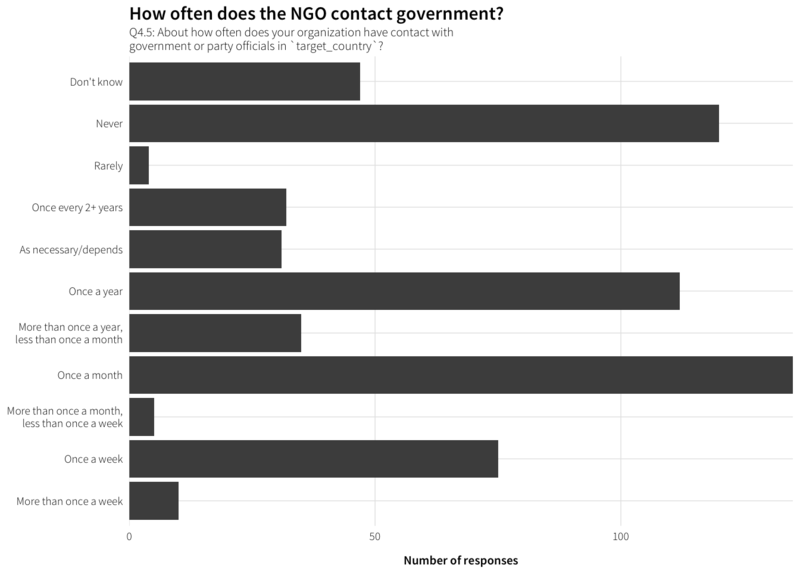 Which countries did NGOs answer about? 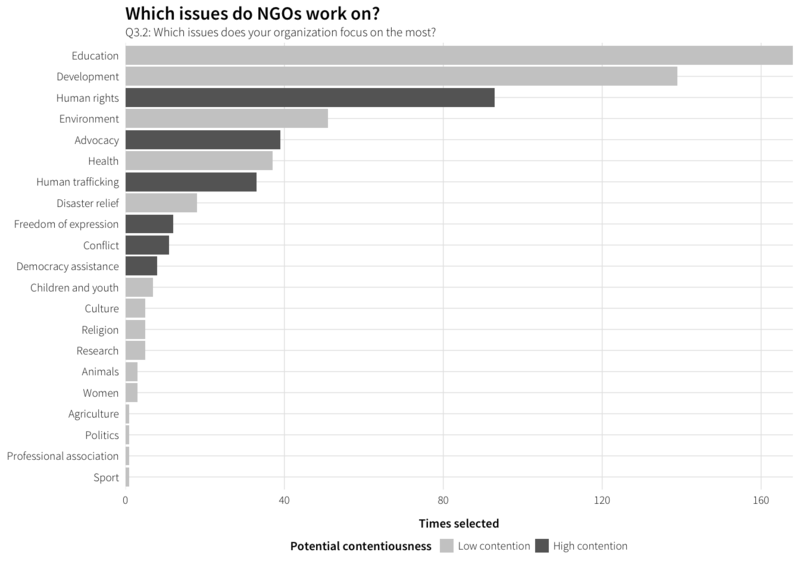 Which issues do these NGOs work on? 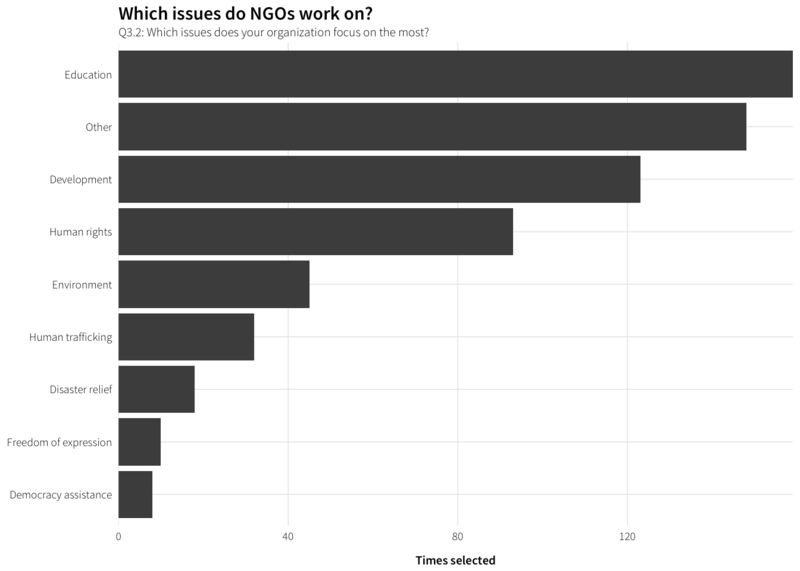 Which issues do NGOs work on the most? There are lots of others, both for all issues and most important issue. What are they? There are 300+ other issues here. That’s a lot. Natural language processing can help make sense of the mess. 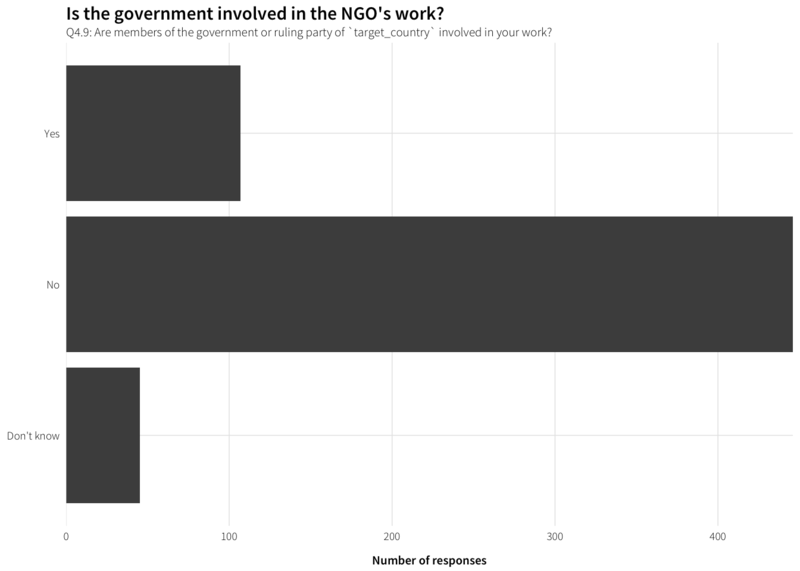 Lots of NGOs deal with rights, health, and developent. Do they qualify those broader issues? Imputing latent themes from these other topics algorithmically is tricky though. K-means, PAM, latent semantic analysis (LSA), and latent dirichlet allocation (LDA) all choke, since the corpus isn’t that big and the “documents” are super short (often just one word long). 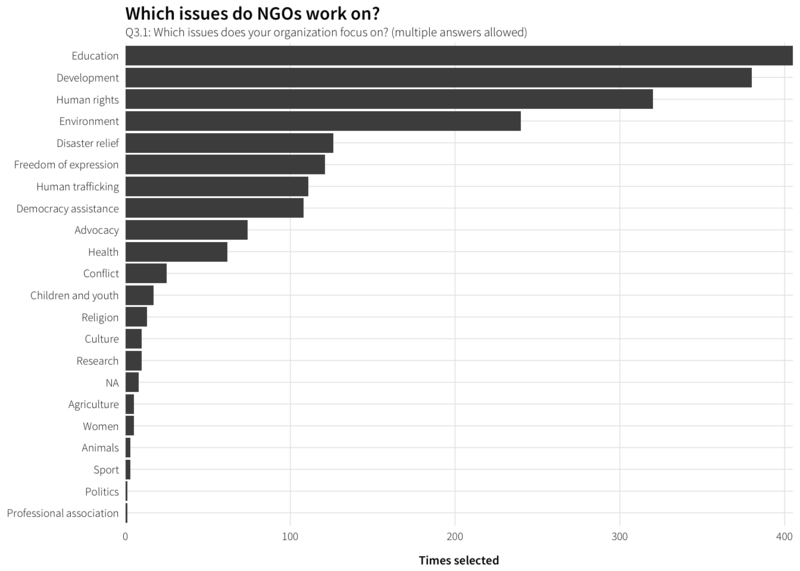 I attempt each of these in /Analysis/ingo_survey/sandbox.R, but none of them work well, even for coarse sorting. 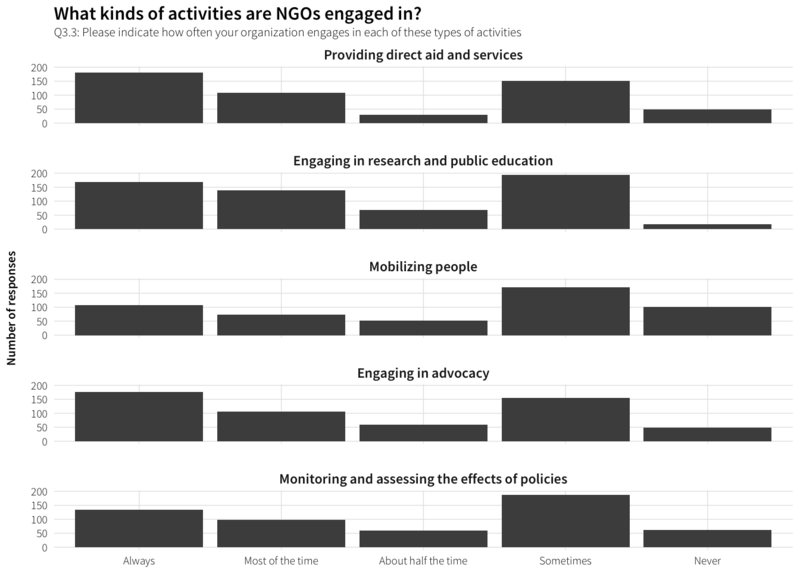 What kinds of activities do these NGOs engage in? "We do not collaborate with other\norganizations or institutions"
What are the other organizations? 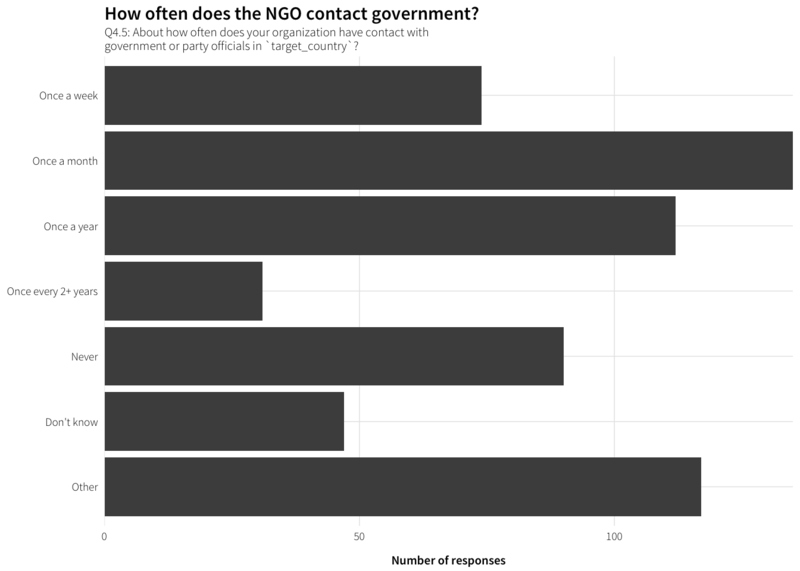 Seems to mostly be universities, research centers, foundations, and religious groups. 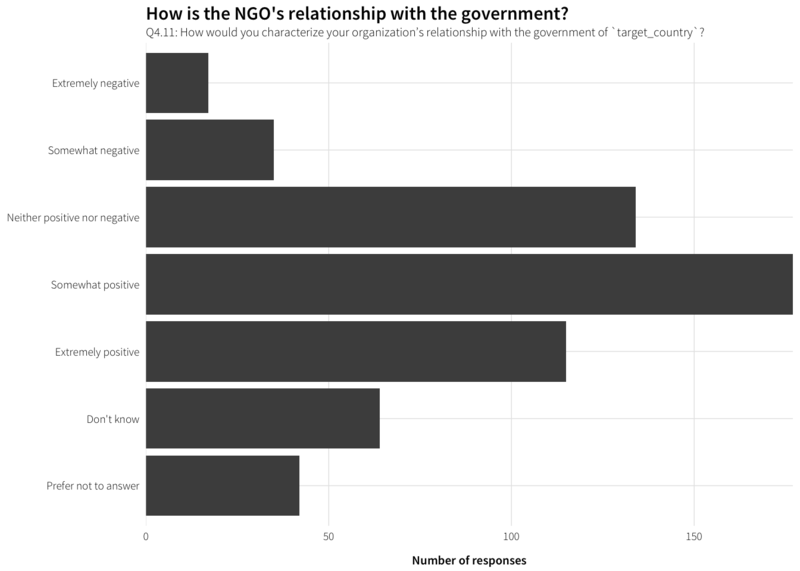 What other sources of funding do NGOs use? The EU, churches, membership fees, etc. 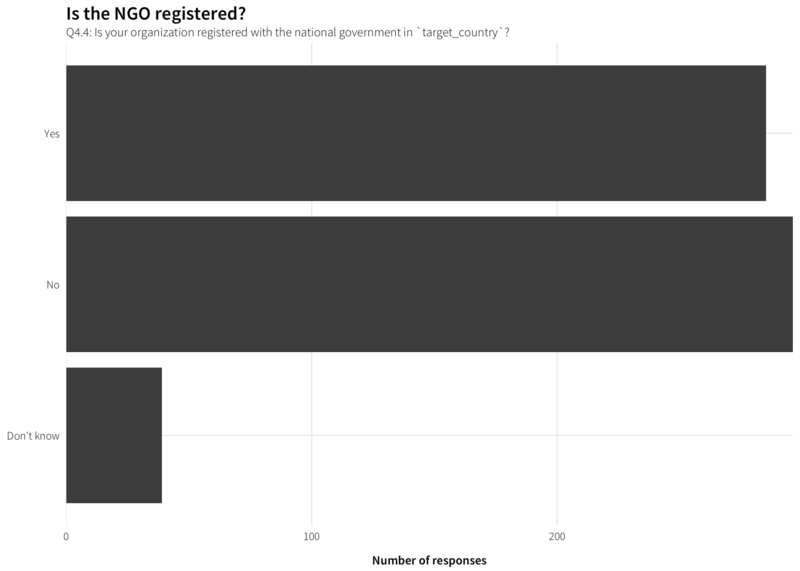 What is the NGO trying to accomplish? Q3.9: In general, what would you say your organization is trying to accomplish? How are mission, vision, and values reflected in activities? Q3.10: How is your organization’s mission, vision, and values reflected in these objectives? Q3.11: Have these objectives changed at all in the last 10 years? If so, how? Q3.12: What are the major obstacles, if any, to reaching your organization’s objectives? Q3.13: Are there any changes that you would like to see in your organization’s goals and strategies, now or in the future? "Maintain a physical office staffed\nprimarily by people from target_country"
"Maintain a physical office staffed\nprimarily by foreigners"
What other kinds of frequency do people report? 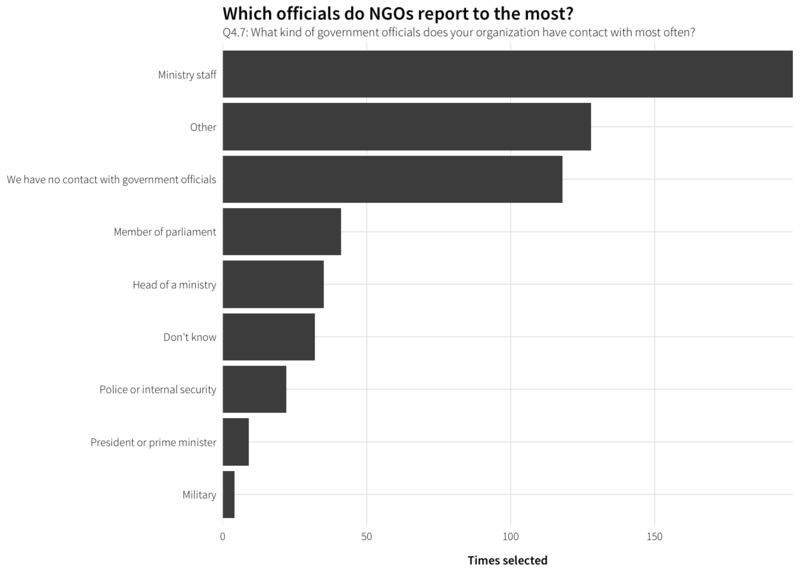 Are members of the government involved in work? How is government involved in work? 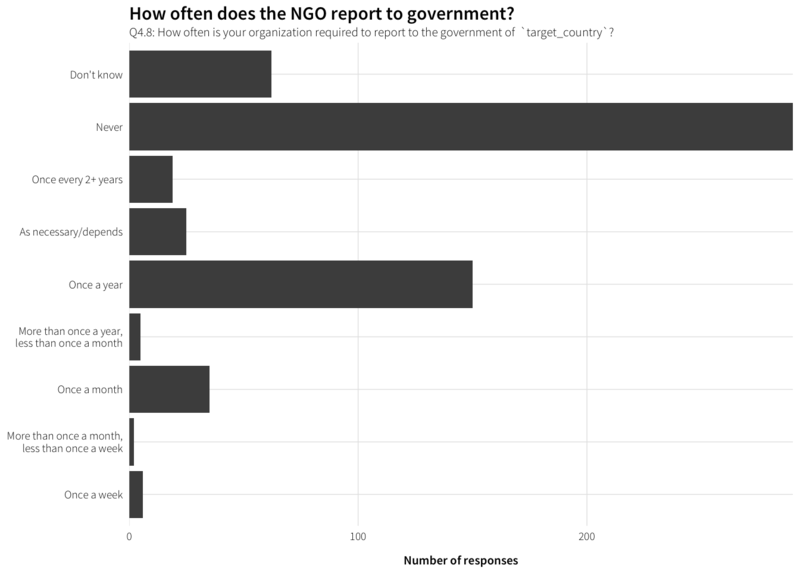 Q4.10: How is the government of `target_country`` involved in your work? 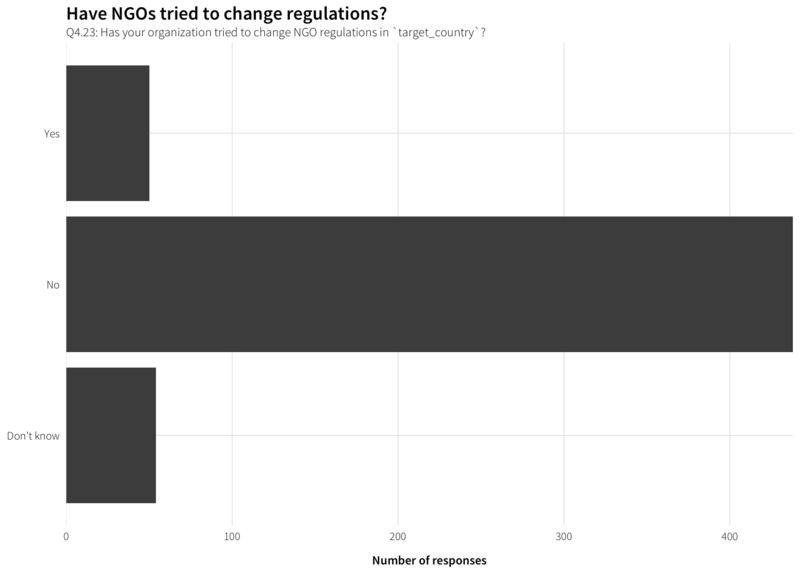 How do NGOs find out about changes? 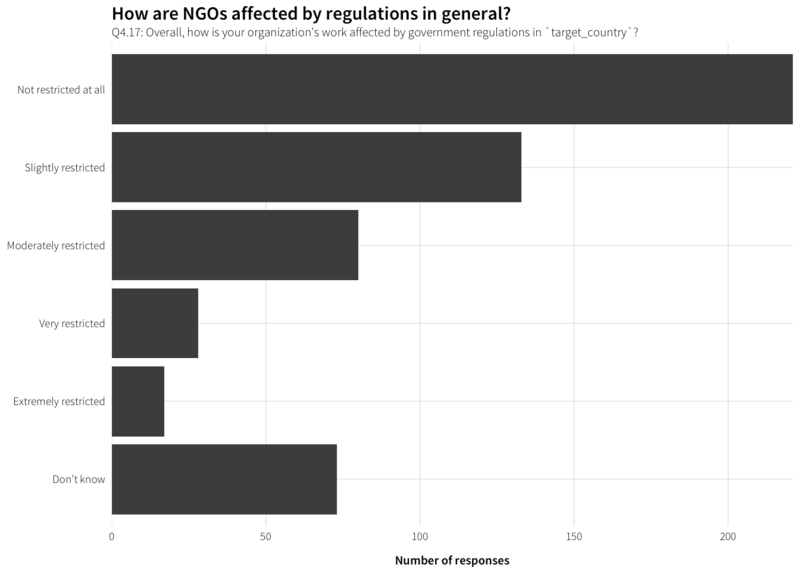 How are NGOs affected by regulations? Q4.16a: Please describe how your organization is affected by regulations regarding registration. Q4.16b: Please describe how your organization is affected by regulations regarding operations. Q4.16c: Please describe how your organization is affected by regulations regarding speech and advocacy. Q4.16d: Please describe how your organization is affected by regulations regarding communication and cooperation. Q4.16e: Please describe how your organization is affected by regulations regarding assembly. 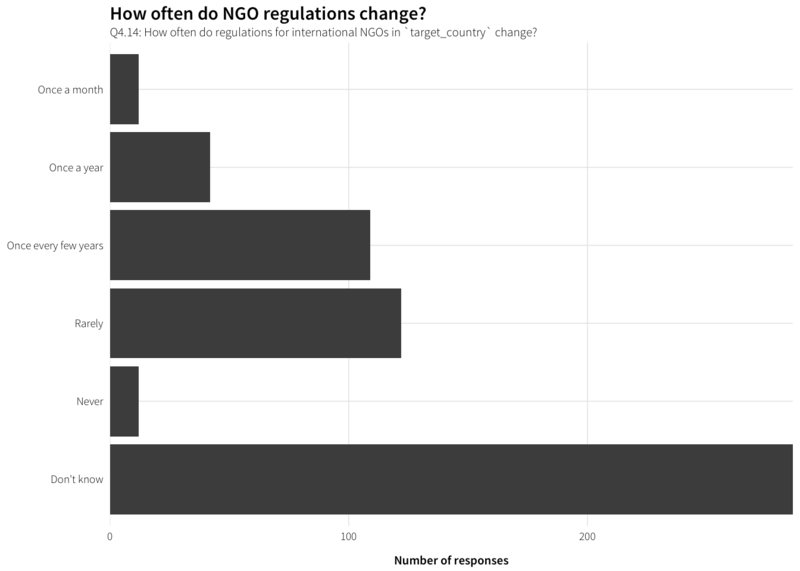 Q4.16f: Please describe how your organization is affected by regulations regarding resources. 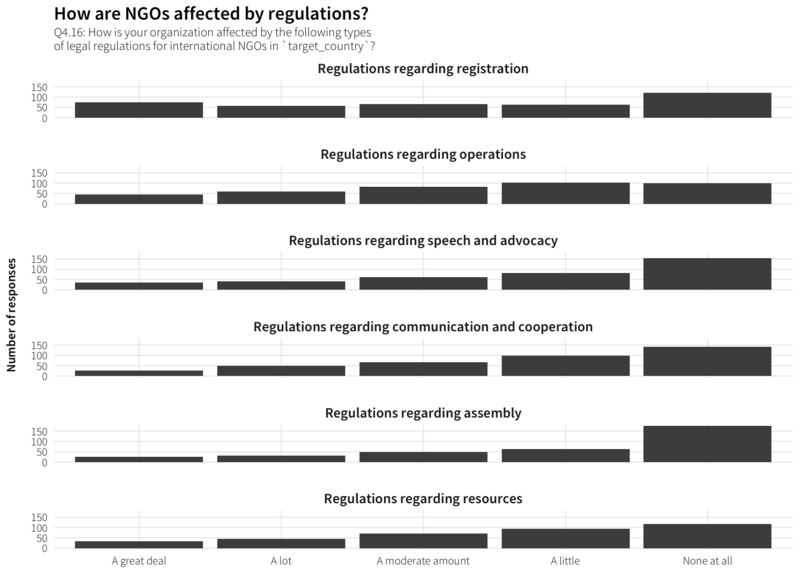 How are NGOs affected by regulations in general? 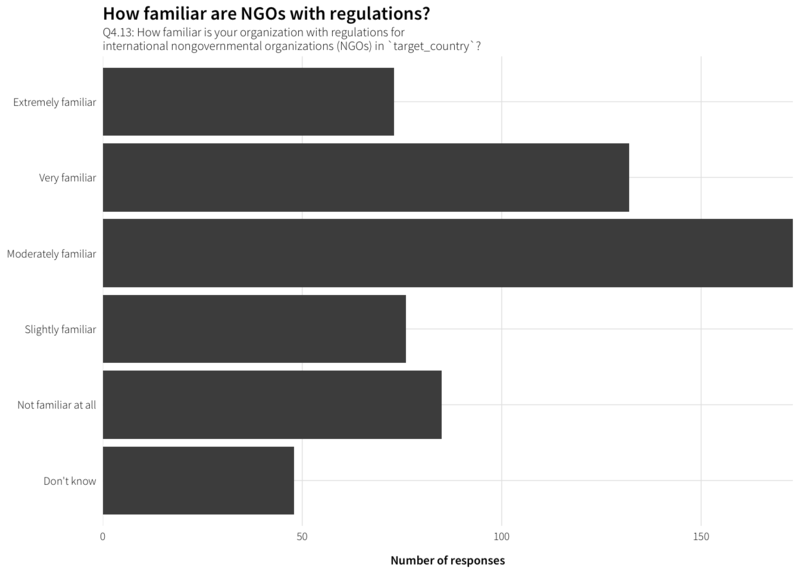 Q4.18: How do the local laws and regulations in target_country affect your organization’s ability to pursue its mission? 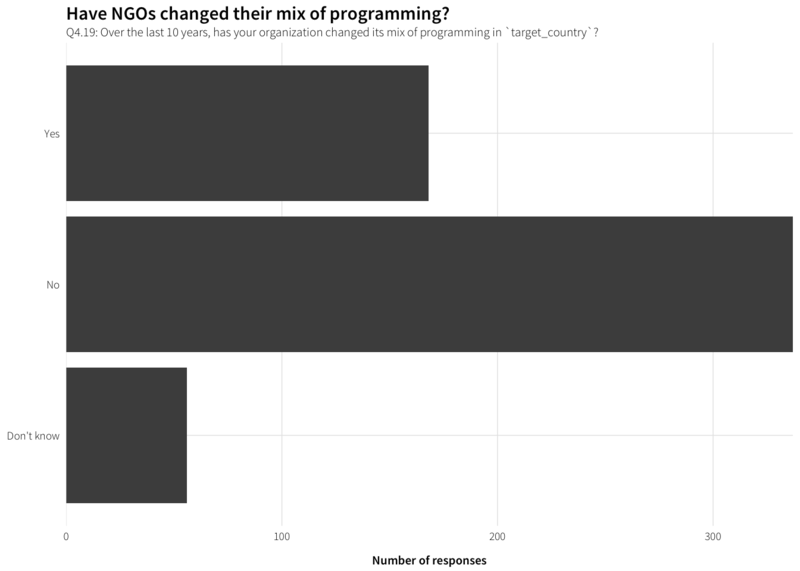 Q4.20: How has your organization’s mix of programming changed in target_country? 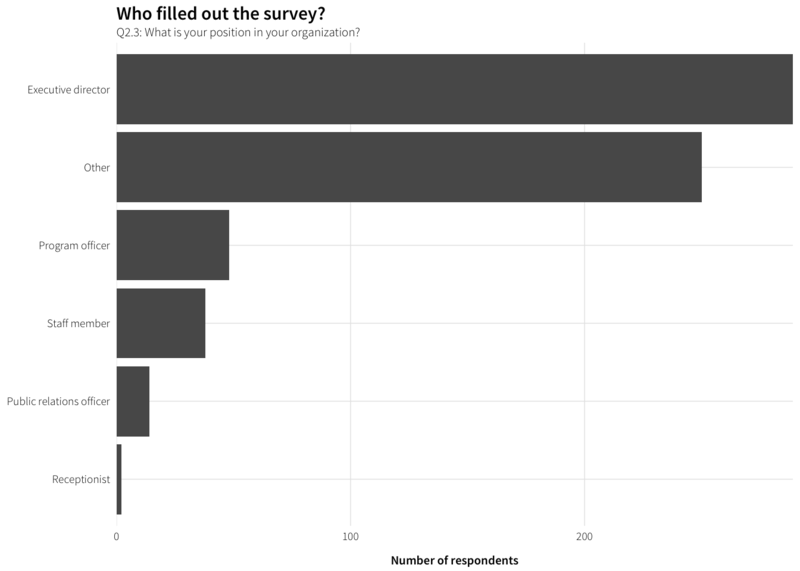 Q4.21a: Please describe how your organization changed its funding sources. What regulation were you responding to? 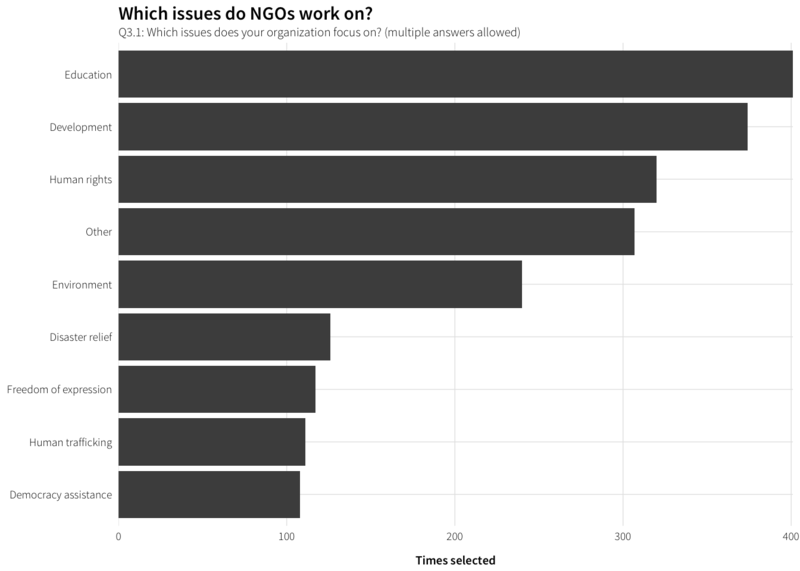 Q4.21b: Please describe how your organization changed which issues it works on. What regulation were you responding to? 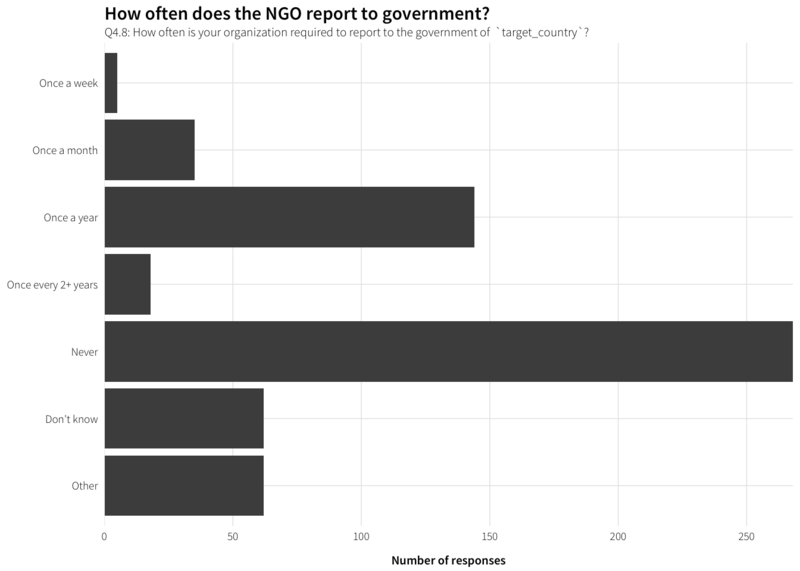 Q4.21c: Please describe how your organization changed how it communicates with the government. What regulation were you responding to? 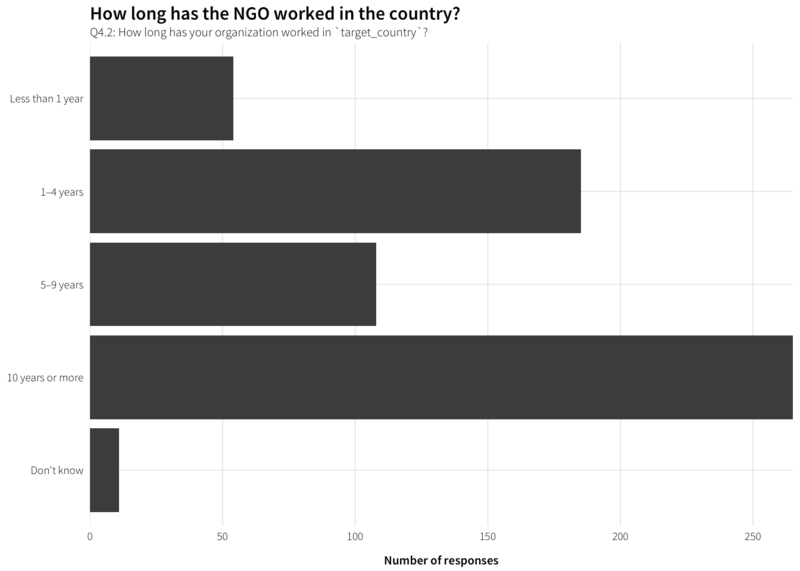 Q4.21d: Please describe how your organization changed how it communicates with donors. What regulation were you responding to? 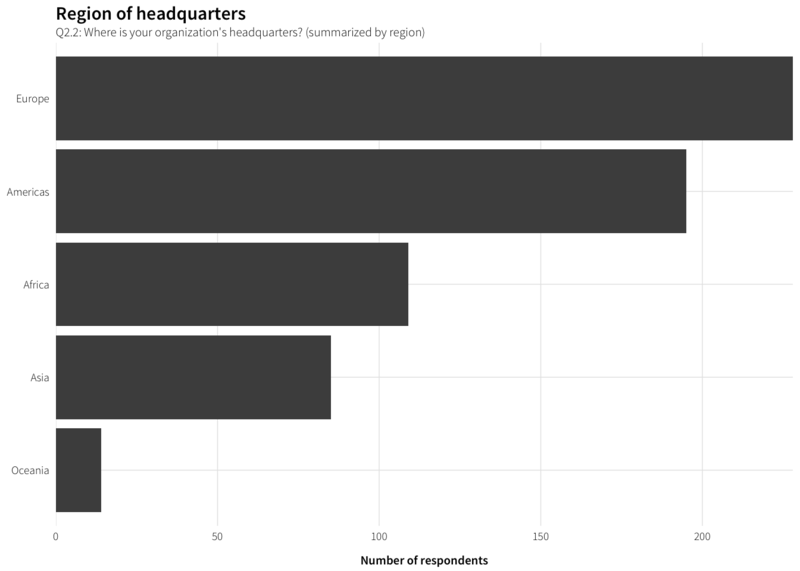 Q4.21e: Please describe how your organization changed the locations it works in. What regulation were you responding to? 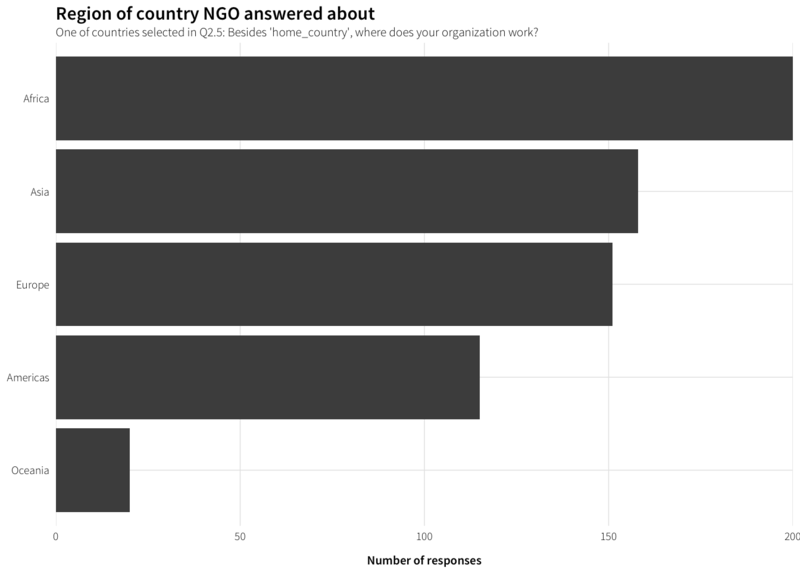 Q4.21f: Please describe how your organization changed the location of its country office. What regulation were you responding to? 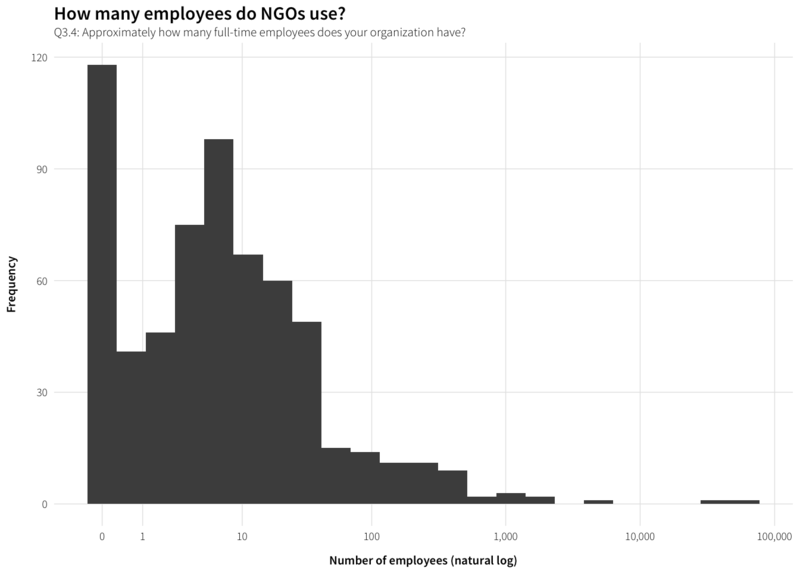 Q4.21g: Please describe how your organization used more local staff or volunteers. What regulation were you responding to? 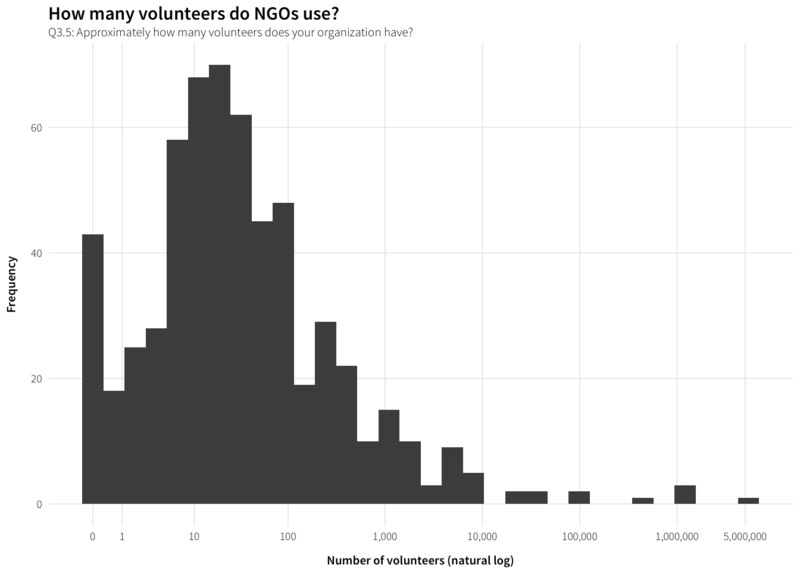 Q4.21h: Please describe how your organization used more foreign staff or volunteers. What regulation were you responding to? 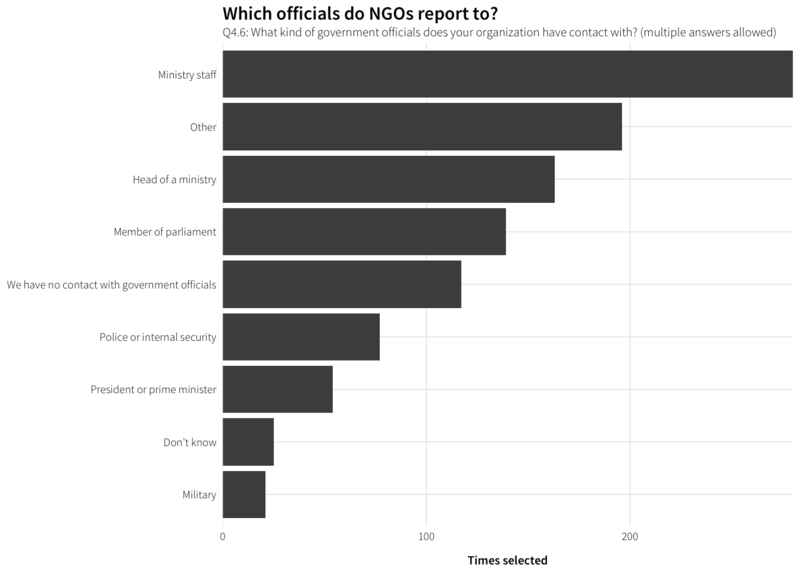 Have NGOs discussed regulations with government? 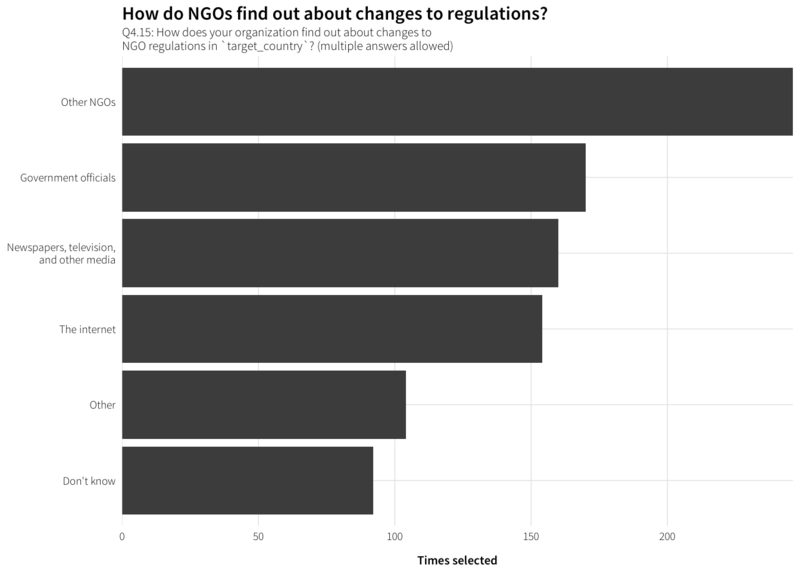 Have NGOs tried to change regulations? Q5.1: Do you have any additional comments?